After analyzing thousands of Datablocks, here are the most common and important AdWords metrics that Databox users are tracking. Successful advertising is all about matching your promotion with the user’s intent. While intent itself is hard to measure, the digital ad landscape has enabled marketers and advertisers the ability to leverage user data to get closer than ever to matching their promotion with the people who need and/or want it most. Perhaps no platform does this better than Google AdWords. While other platforms, most notably Facebook Ads, can match Google when it comes to the amount of user data they have to monetize, Google still holds the holy grail–the search query. As you can see below in the latest sampling compiled by Rand Fishkin of Sparktoro, the share of searches across the web is not even close. And nothing is a more powerful indicator of intent than what a user is searching for right now. Moral of the story? Google AdWords is arguably the most powerful ad platform when it comes to matching your promotion with user intent. To better understand which metrics are most important to track, we dug into our user data to identify the 10 most-tracked AdWords metrics by the number of Datablocks used in Databox. We also leveraged our friends over at Smartbug Media, a Databox Premier Agency, to lend their insights from a qualitative standpoint. 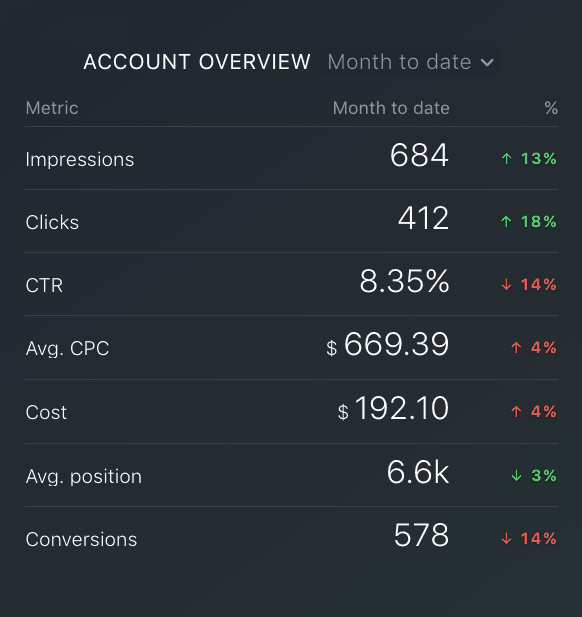 If you’d like to track the following AdWords metrics (as well as others that are important to you) in a similar fashion as what’s shown below, you can grab this free template here and visualize your data in minutes. Any time your ad is shown on a search result page via Google or the Google Network, this counts as one impression. Essentially, it’s the number of times your ad is “seen”, although this is a term that should be used loosely, as just because your ad is shown on a search result page, it doesn’t mean that the user actually saw it. This is how much money you’ve spent on your ad campaign so far. Recommended Datablock: Daily line graph. “Clicks” are recorded any time someone clicks on the blue, linked text of your ad. It’s important to note that if someone clicks your ad and is unable to reach your website (404 error, wifi issues, etc.) their engagement will still be logged as a click. This is the average that you’ve been charged for clicks on your ad campaign. Your average cost-per-click (CPC) is calculated by dividing the cost of your clicks (or the amount you’ve spent on the campaign thus far) by the total number of clicks. Recommended Datablock: Account overview with comparisons turned on. Conversions are counted whenever a user clicks your ad and then takes an action that you’ve defined as important, i.e. a visit to a specific web page, a signup, etc. Recommended Datablock: Number block with comparisons turned on. This is the total number of impressions segmented by each AdWords campaign you have running. This might be helpful to look at in order to determine which subjects and keywords have the volume and ad inventory necessary for you to generate results. Recommended Datablock: Account overview with comparisons on. An ad group is a group of ads that are targeting a shared set of keywords. 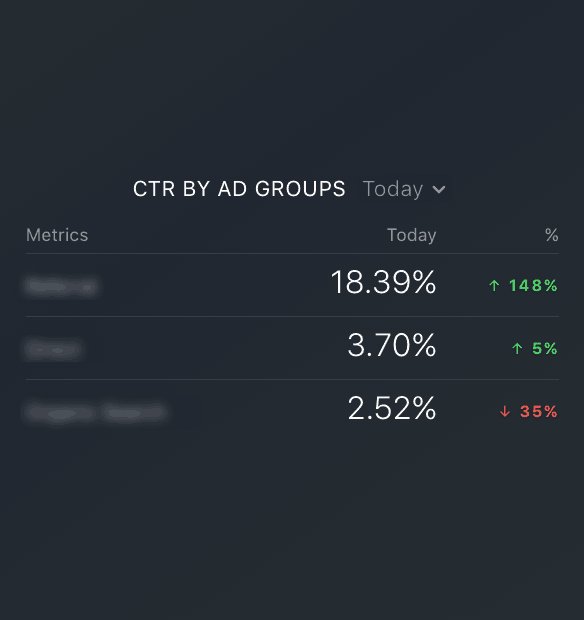 CTR by Ad Group is simply the click-through-rate of each of your ad groups. 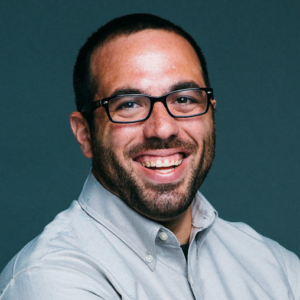 This is the click-through-rate, segmented by campaign, of any/all of your AdWords campaigns. Monitoring this will help you to see which campaigns, keywords, and/or ad groups are generating higher engagement. We track CTR by Campaign in a table Datablock (can you tell we really like the table Datablock?) 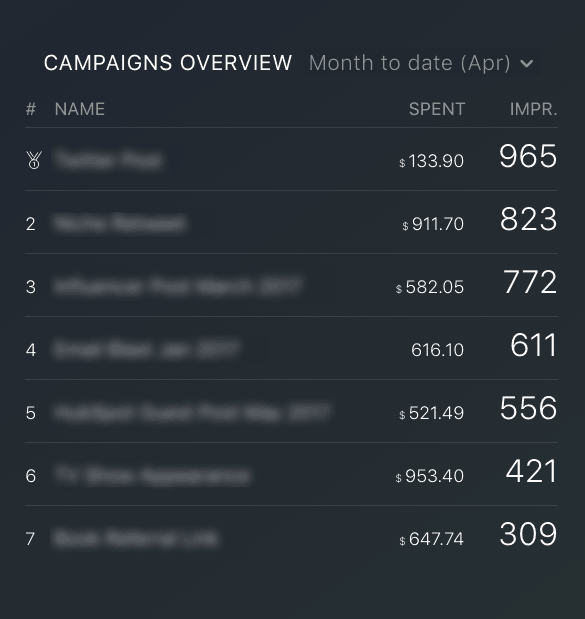 using month-to-date timeframe so we can see live data on which campaigns are performing the best, and actively move funds to support those campaigns. Another way we track CTR by campaign is in the Campaign Overview table block.” – Havenridge. 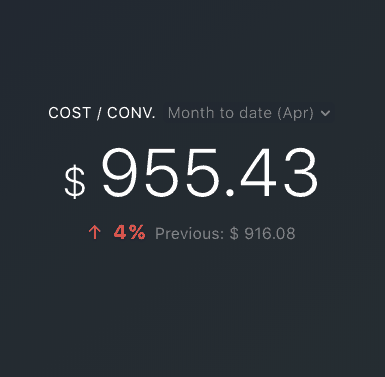 This is the average you’ve been charged for a conversion from your ad campaign. It’s calculated by dividing the total cost of conversions by the total number of conversions. *Remember, conversions are activities that you set in your AdWords campaign that note important business activities, such as purchases, signups, etc. Your click-through-rate is the overall ratio of how often people who see your ad actually click your ad. It’s calculated by dividing the total number of clicks your ad receives by the total number of impressions. Want to track all of your Google AdWords performance in one place? Need an easier way to track your AdWords performance? You can grab this template for free and start visualizing your AdWords performance in minutes. 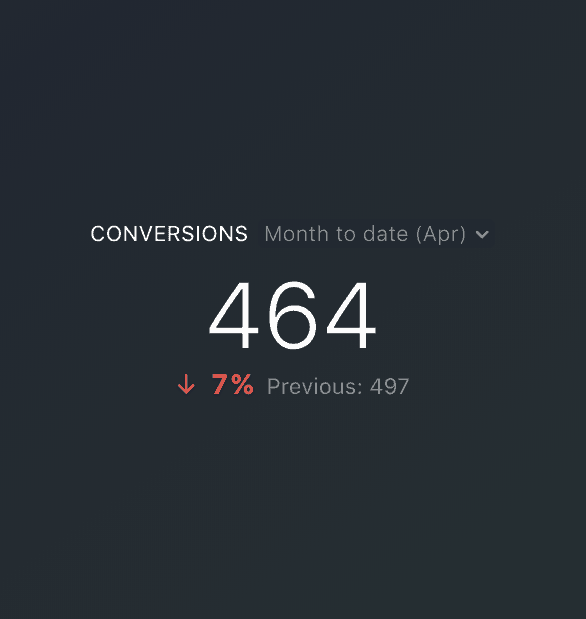 You can even pull data from Facebook Ads (or other ad platforms) into your dashboard so you can track all of your paid acquisition in one place. 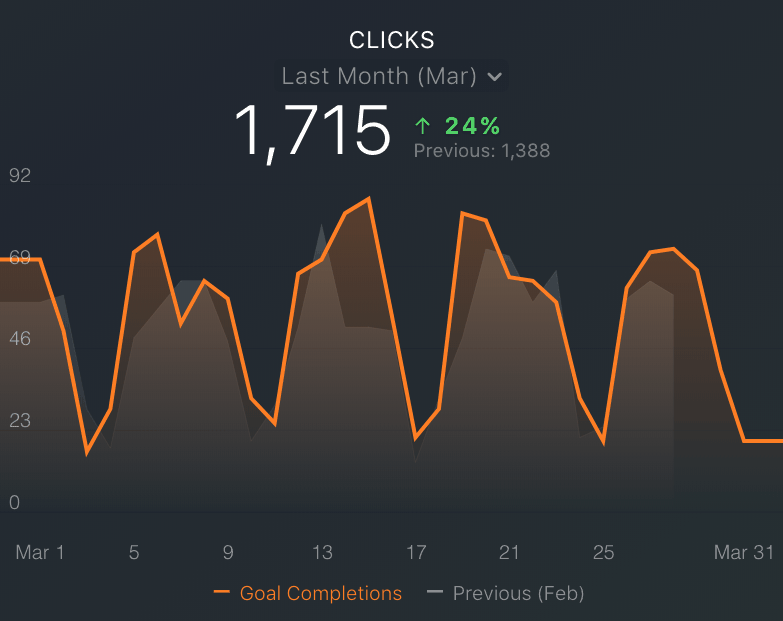 After analyzing data from thousands of Databox users, here are the most-tracked HubSpot Marketing metrics and how marketers are visualizing them. 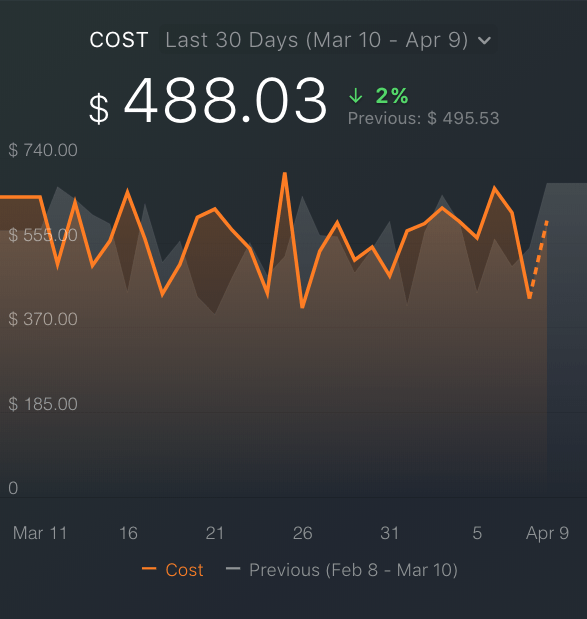 Data from thousands of Databox users, here are the top Google Analytics metrics and the visualizations they’re using to track them.